The Darryl Worley & Ty Herndon at the Welk Resort Theater is one of Branson shows where the two amazing musicians perform a spectacular one-night show in a family-friendly atmosphere that will make everyone enjoy the show till the last minute. Scheduled to perform on May 25, 2018 in Branson stage, the two awesome talents bring high-energy show that will leave everyone wanting an encore. Be sure not to miss this impressive one-time Branson show and make your trip more memorable than you could have imagined. As a talented vocalist who has been in music business since 1999, Darryl Worley has been performing for fans of all ages since the start of his career. His outstanding vocal skill and upbeat personality shine through his songs, making the show a great experience for every audience in attendance. Ty Herndon has started his music career in 1995 and released his hit single ‘What Mattered Most.’ He had singles from his first three albums that peaked at number one each time, that made his fame even higher. Ty Herndon will leave you wanting for more with his amazing music. Darryl has racked up nearly twenty singles on the Billboard Hot Country Song charts, three of which have landed in the top chart spot. Some of Darryl hits that you will hear in the show include “I Miss My Friend,” “A Good Day to Run,” “Have You Forgotten,” “Second Wind,” and “Awful, Beautiful Life.” Darryl Worley has a heart that’s as big as his talent, especially when it comes to children. He hosts an annual charity event that benefits the Darryl Worley foundation, a non-profit organization that supports Cystic Fibrosis, Le Bonheur Children’s Medical Center, and St. Jude Children’s Research Hospital. The music career of Ty Herndon that have spanned two decades, have earned him 20 Billboard charted singles and over five million albums sold and has still no signs of slowing down. His chart debut in 1995 with “What Mattered Most,” became his first #1 song and garnered a Song of the Year award with Music Row Magazine. Herndon charted 17 singles between 1995 and 2002, including his three #1s and numerous top 10 hits, such as “I Want M Goodbye Back,” “Loved Too Much,” “A Man Holding On,” and “Hands of a Working Man.” In 1996, Herndon topped the charts with the single “Living in a Moment” and again in 1998 with “It Must Be Love.” Like Darryl Worley, Ty Herndon is also supporting charity organizations that are dear to his hearts. 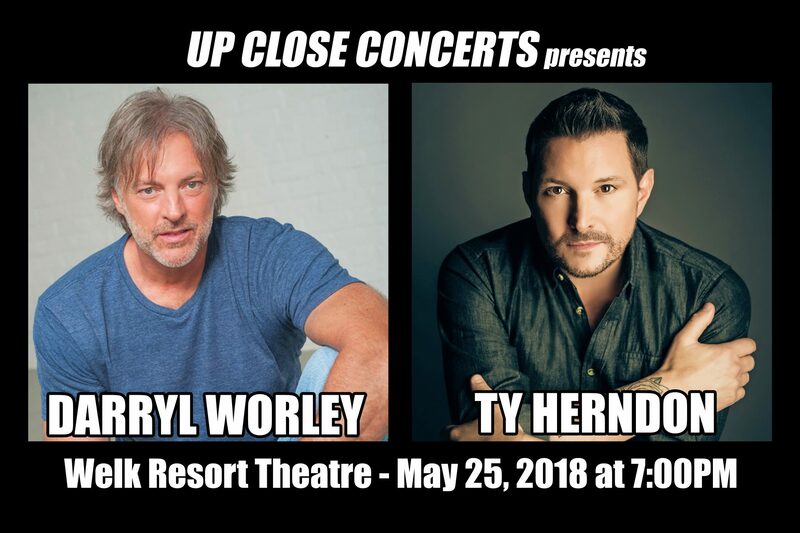 So, if you want to witness the amazing talents of Darryl Worley & Ty Herndon, don’t miss their one night Branson show at the Welk Resort Theater.